If you are a resident of cities in El Dorado County like Folsom, El Dorado Hills, Placerville, Coloma and Lotus, just to name a few…take a whitewater rafting trip in your own backyard on the American River. Whitewater can be found less than an hours drive away along Hwy 49 and Hwy 80. 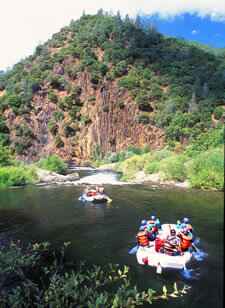 The Tom Sawyer Float Trip is great for young children while the Class III rapids on the South Fork American give you the option to raft the Upper section from Chili Bar or the Lower section to Folsom Lake. Looking for some intermediate Class III / IV rapids? The Middle Fork American trip meets at Forrest Hill and floats through a “Wilderness” canyon in Auburn State Park. Not too many people can hit the slopes one day and raft fresh spring snowmelt the next! The intermediate / advanced Class IV rapids of the North Fork American get the season going in April-May.